Think golfing in Saratoga is just for late spring through mid-summer? 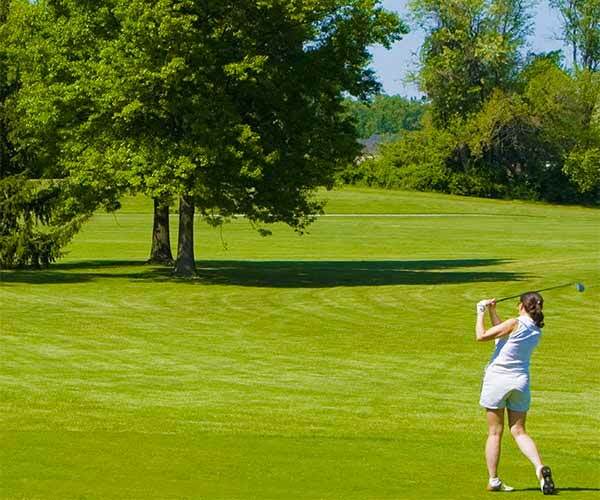 Think again &#8211; for you can enjoy Saratoga golf courses nine out of 12 months every year. Imagine taking your plus fours and the four iron out from their winter storage and hitting the links as early as March. You can on the dozens of Saratoga golf courses available to you here in gorgeous upstate New York. The daffodils will greet you as you head to the fairways that are lush from spring rains. Or, if you wait just a few weeks, many trees will be in full bloom and the scent of lilacs will fill the air as you make that putt..
And then...summer! Teeing off on a cool June morning on one of the more than 50 public Saratoga golf courses. The days seem to last forever in the summer &#8211; perhaps you could get another 18 holes in before heading to dinner at the clubhouse and then watching the fireflies as you relax on the club's deck with a cocktail or two. You'll want an early tee time on the fairways in August to avoid the heat of mid-summer day -- but that just means you'll be ready for the first post of the day to watch the thoroughbreds run at the at the world-famous Saratoga Race Course. The sultry days of August then give way to the cool-and-getting-crisper days of September. Walk our fairways and you'll be dazzled by the rich golds, reds and oranges of the trees. Come on by in October and November for some great Saratoga golf outings in the brisk autumn air. Our links are less crowded then, and our fairways are no less fantastic. All good seasons must come to an end, and the nine-month Saratoga golf season is no exception once Thanksgiving comes around. But take heart &#8211; March and early-spring Saratoga golf is just three months away!